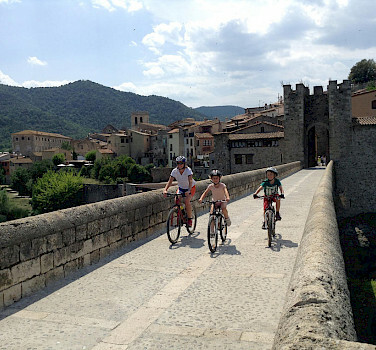 What a perfect spot for you bike tour and multi activity experience in Girona, Spain! Mas Pelegri is a sports hotel and training center in Catalonia. 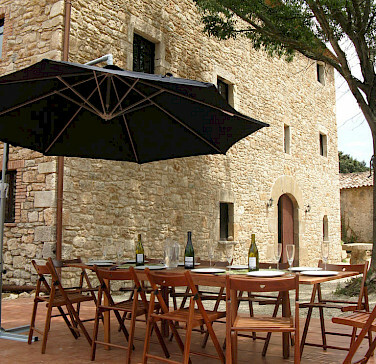 This historic stone masia is located in the province of Girona, an ideak location for all types of cycling with routes leading straight from the door! 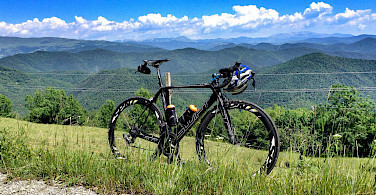 The Pyrenees, the Garrotxa Volcanic National Park, and the Mediterranean are all within cycling distance and provide a backdrop of beautiful scenery. 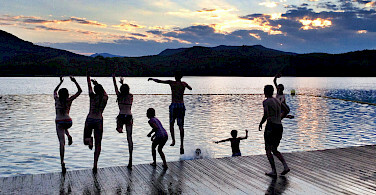 The pristine lake of Banyoles, used in the Barcelona Olympics, is just 7 km away. 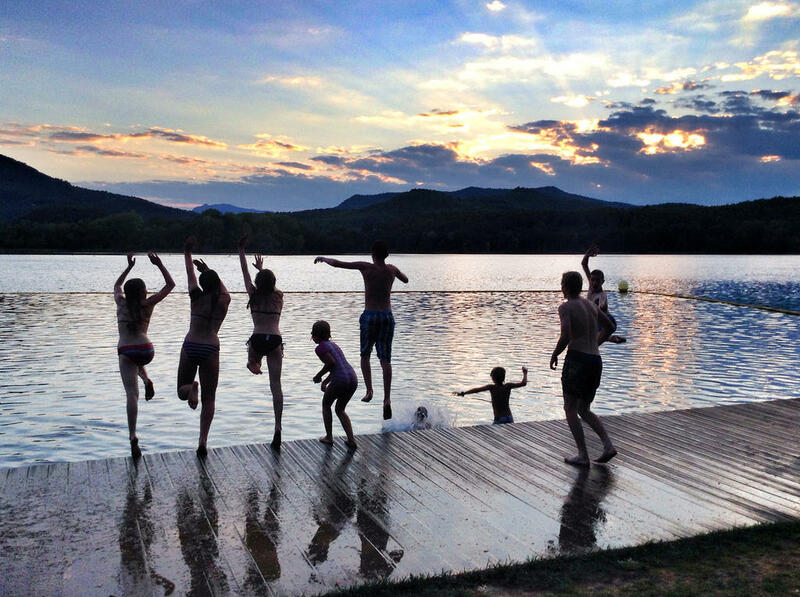 Other activities offered are cycling, mountain biking, horseback riding, kayaking, trail running, swimming, hiking, rock climbing, zip lines, site seeing, and last but not least, renowned wine and cuisine! Looking for more? 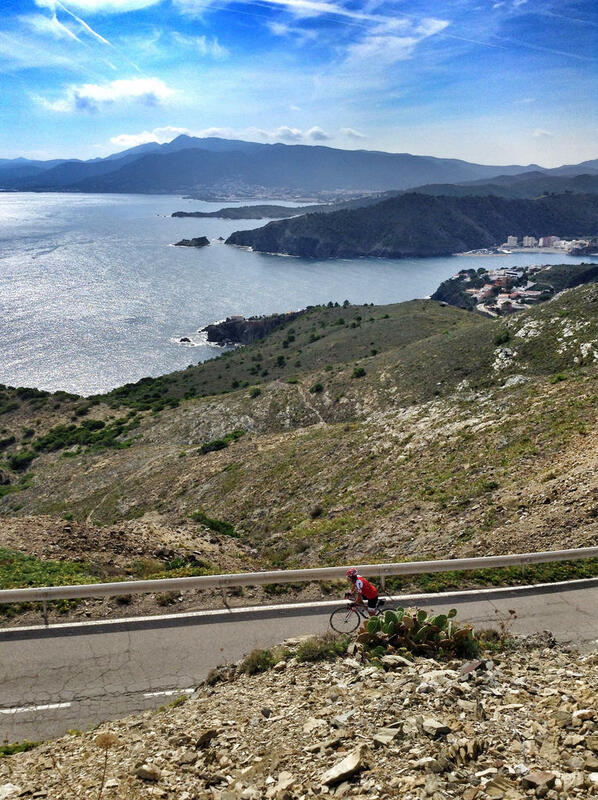 Be sure to look over all of our bicycle tours in Spain. For rates less than or longer than a week please contact us for the exact rate. Weekend rates available. * In July and August there is a 10% surcharge if not booked Saturday to Saturday or for 10 nights or more. Airport transfers available. Please ask us. Fly to Barcelona International Airport (BCN). 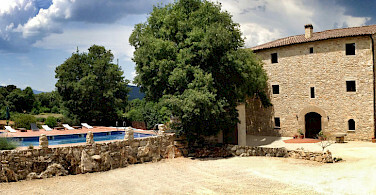 Hotel Mas Pelegri is located 2 km from the small town of Serinya, in the province of Girona. From the airport, you can take either a bus or train. Bus: There is a bus service (Sagales) from BCN to the city of Girona. Bus times vary with the seasons. The bus leaves from both terminal 1 and terminal 2. There is a bus service (Teisa) from Girona city to Serinya. We can arrange free transfers from Serinya bus stop to Mas Peligri. Train You can get the train from BCN terminal 2 into Barcelona and then change trains to the city of Girona, at Sants or Passeig de Gracia train station in Barcelona. Schedules at Renfe.es. The weather in the small town of Serinyà is mild year round. Please check local conditions before your arrival. A good website to use to explore average high/low temperatures and average rainfall is href="http://www.weatherbase.com/weather/weather.php3?s=591933&cityname=Girona-Spain.com" target="_blank"rel=nofollow >Weatherbase. 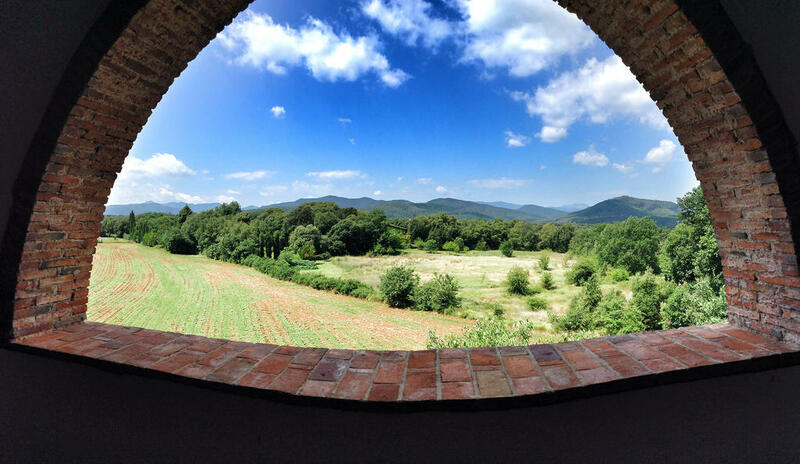 Hotel Mas Pelegri, 3 star ecological sports hotel set in 5 acres of Catalan countryside. The historic stone hotel has been refurbished with luxury in mind, with 17 bedrooms, all with their own private bathroom. Three of the rooms are suites with sitting area and we also have six new garden suites with walk in showers and fridges and an exterior BBQ kitchen area. Arrival possible all year round in 2019. Minimum stay is two nights. Pricing is based on a 7 night stay. This is a guided or self guided hotel based tour with an assortment of activities offered. The cycling can range from easy to difficult on hybrid, mountain, or road bikes. Length of stay can vary as well. *This facility provides very customized tours for each individual guest. You can indicate to us the distance that you would like to cycle and what type of bike and terrain you prefer: mountain bike, hybrid trail bike, or road bike. There are over 100 routes from the door of the hotel to choose from! After settling into your accommodations at Mas Pelegri, you will be fitted for a rental cycle or assisted in assembly your own bike. 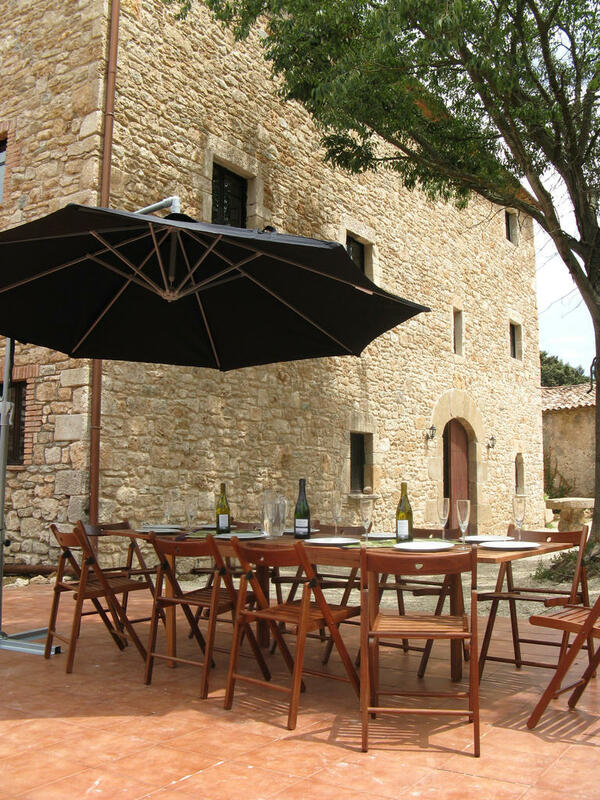 You will then have opportunity to take a short ride through the Catalan countryside, past ancient stone villages and old farms with time to relax by the pool before dinner. 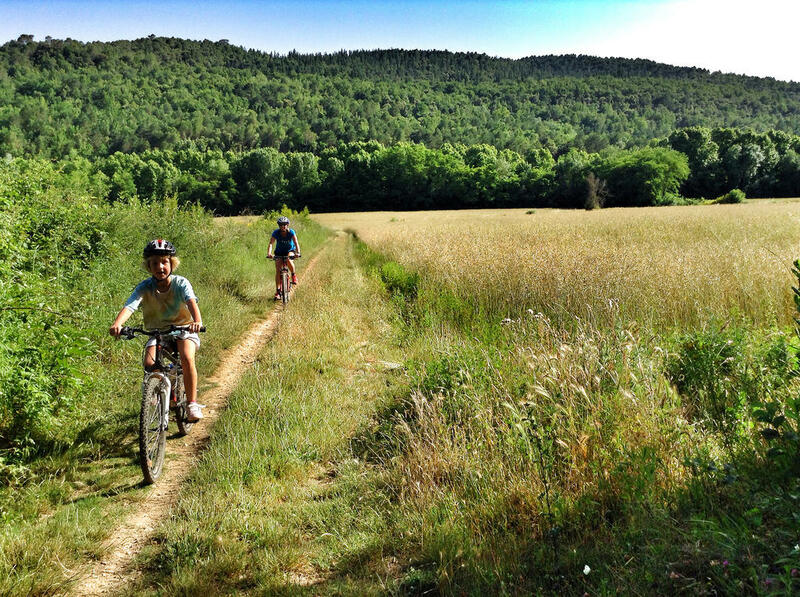 The morning can begin with a ride through the beautiful rolling countryside of the Pla D'Estany (the land of the lake) visiting the villages and enjoying the fields of sunflowers or poppies (depending on the time of year). In the afternoon, after lunch, you can visit Dali's Museu de Teatre in Figueres. Today you can enjoy the Sant Marti D'Empuries Beach loop which winds through the rolling countryside of the Pla D'Estany before reaching the beautiful small village of Sant Marti D'Empuries, with its sandy beach and the spectacular Greek and Roman ruins of Empuries. You can enjoy a dip in the sea after lunch and a visit to the ruins. This afternoon and evening can be spent in Girona with opportunity to enjoy dinner here. 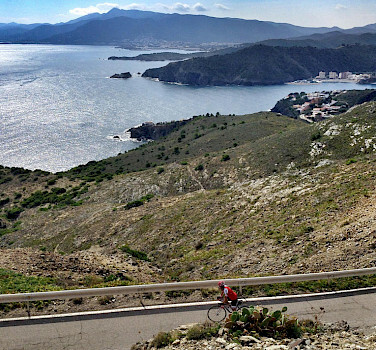 This is a beautiful bike ride around the the area that influenced Dali's paintings, the Cap de Creus. 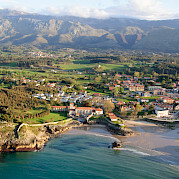 This is where the Pyrenees descend to the sea with small islands along the coast. 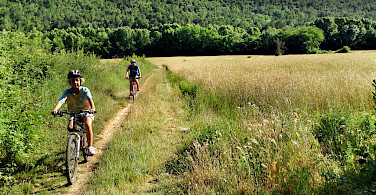 The cycling begins in the wine growing area of the Alt Emporda with its rolling hills, olive, and wine groves. There is opportunity to climb up to the 10 th century majestic Benedictine Monastery of St Pere de Rodes which overlooks the Cap de Creus Natural Park and the Mediterranean. Descending once again to the sea, you can visit Cadaques for lunch and visit Dali's home and studio in Port Lligat, once a small fisherman's hut. Dali was drawn here by the landscape, the light, and the isolation of the place. 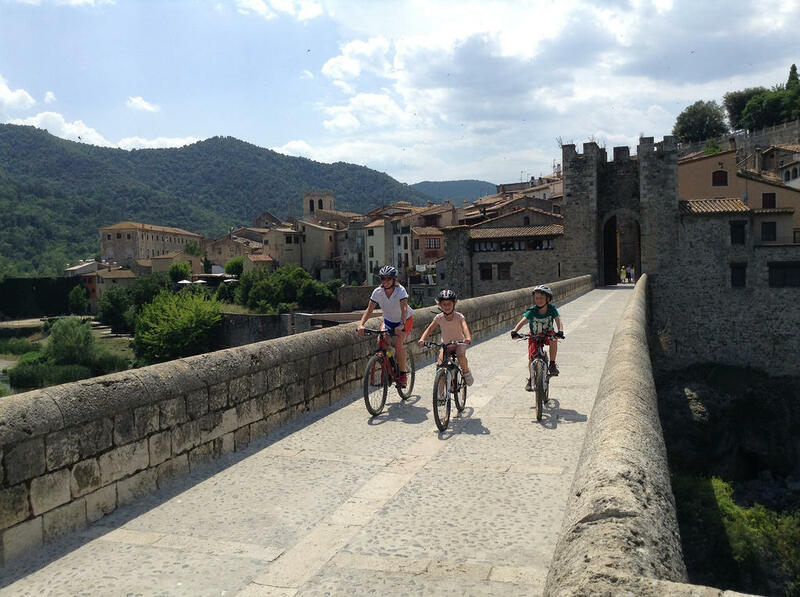 First on the agenda is a lovely descent down to the lake at Banyoles with a chance to visit its ancient market. As you wind your way up into the Volcanic National park, the route leads you through the ancient village of Santa Pau. These are dormant volcanoes, not extinct, although they have not erupted for 12,000 years. 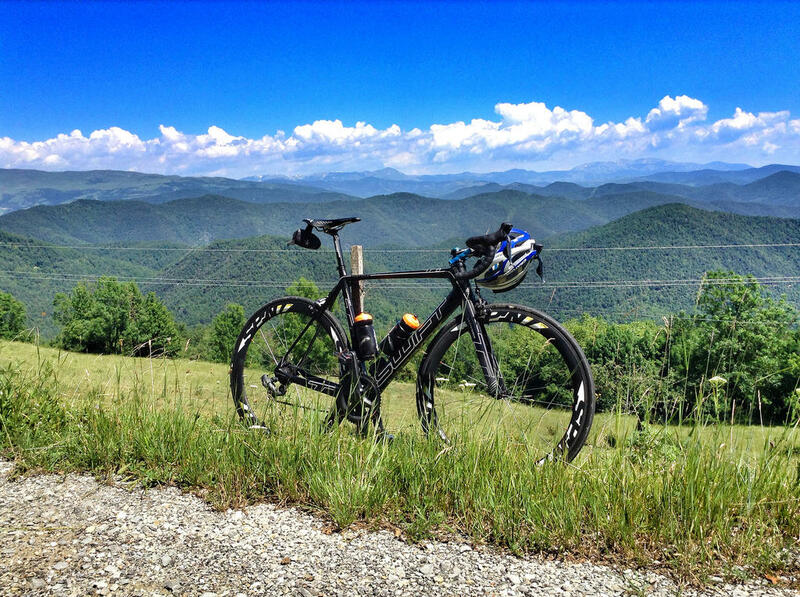 Another lovely descent will lead into Olot with the Pyrenees as a backdrop. Sant Joan les Fonts is on the agenda, followed by Castellfollit de la Roca, one of the smallest towns in Catalonia. The sight of the church and the houses high on the edge of the basalt precipice has become one of the most photographed and painted images in Catalonia; it is also however a magnificent natural viewpoint overlooking the valleys of the two rivers. Montagut and Tortella, small Pyrenean foothill villages, will be an interesting stop. You can also take a detour to the beautiful bridge and rock pools close to Montagut, giving you a chance to cool off. 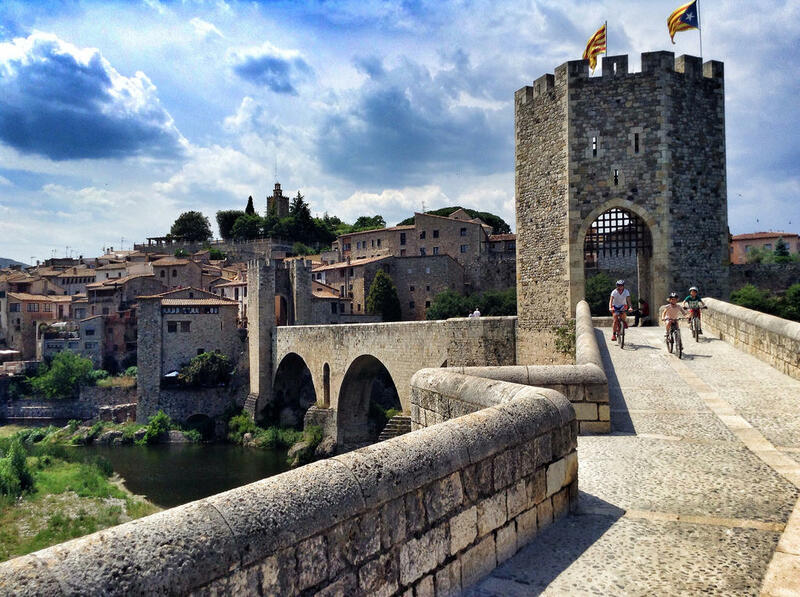 From Tortella you head to the beautiful medieval town of Besalu with its ancient right-angled bridge and sleepy stone paved streets. 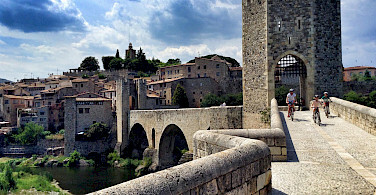 Lunch could be in Besalu at a wonderful local restaurant. There is the possibility a for day trip to Barcelona with opportunity to visit the surreal Sagrada Familia, Parc Guell, and Passeig de Gracia with its interesting architecture. You will also get the chance to visit Las Ramblas, the food market, and other sites depending on your interests and time available. This is a beautiful loop visiting old town Girona and includes climbing over Els Angels, if you would like. 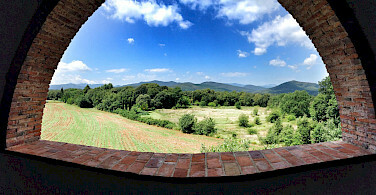 Lunch can either be in Girona or up the top at the restaurant at the converted convent of Els Angels. You will then return to Mas Pelegri for relaxation. This tour is run by Fiona Smart. I loved every moment of my time at Mas Peligri. 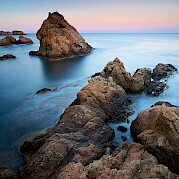 From the moment I got there, I was relaxed and just fell in love with Spain. Fiona and Garett could not have been better hosts. They make sure everyone is happy and go over and above to make your stay amazing. The breakfasts and dinners together were so fun. I have some amazing pictures from my rides and did the horseback riding which was very fun. I did not want to leave and will definitely book another vacation with Mas Peligri.